We troublemakers keep hoping for the spark that will set a wildfire of workers in motion. The worse our situation gets—economically, politically, ecologically—the more we yearn for a vast movement to erupt and transform the landscape. It’s not impossible. Look at 1937, when workplace occupations spread everywhere, from auto factories to Woolworth’s. The 1930s wave of militancy forced Congress to aid union organizing with new laws and to enact Social Security and unemployment insurance. Industrial unions formed during that upsurge continue to this day. Where will the next big movement come from? Fights in the workplace can be the training ground. So why not here and now? In our lifetimes, we’ve seen sparks—but we haven’t seen them spread like that. In some ways we’re more connected than ever before, able to watch each other’s struggles in real time on our phones. Yet mostly, the sparks haven’t leapt from one workplace or one Capitol rotunda to another. The Occupy movement is the shining exception. Why didn’t the occupation of the Republic Windows and Doors factory, at the outset of the Great Recession, start an avalanche of copycats? Or the Wisconsin uprising, or the Walmart and fast food walkouts? Further back, the UPS strike of 1997, or the million people in the streets on May Day 2006? Each time, we felt that charge in the air for a minute, but it dissipated. Perhaps there’s a better way to look at it: each uprising is a rehearsal for the next. Can we trace a global movement, learning and progressing, from Republic, to Egypt, to Wisconsin, then Occupy? Where will the next revolt come from? Today young immigrants are chaining themselves to deportation buses. A thousand “Moral Monday” North Carolinians got themselves arrested for human rights. These mobilizations burst on the scene seemingly out of nowhere, but really grew from years of quiet organizing. And in a true example of leaping sparks, the Chicago teachers’ 2012 strike inspired a cascade of other teachers to demand what their students deserve, with locals priming to strike this year and boycotting those stupid tests. Are we building for something bigger than Occupy next time? Can it include more workers? Who will lead it? How do sparks grow into a raging fire, anyway? Someone has to fan the flames. We need more experienced activists in the mix—people who both know what to do practically and have the vision to do it. In the ’30s, radicals and socialists in the CIO played this role. So one missing ingredient today is more skilled, far-sighted activists, not just on union staffs but in each workplace. Unions’ job is to train up these legions by getting in fights, and by winning some of them. In other words, by going up against the boss. 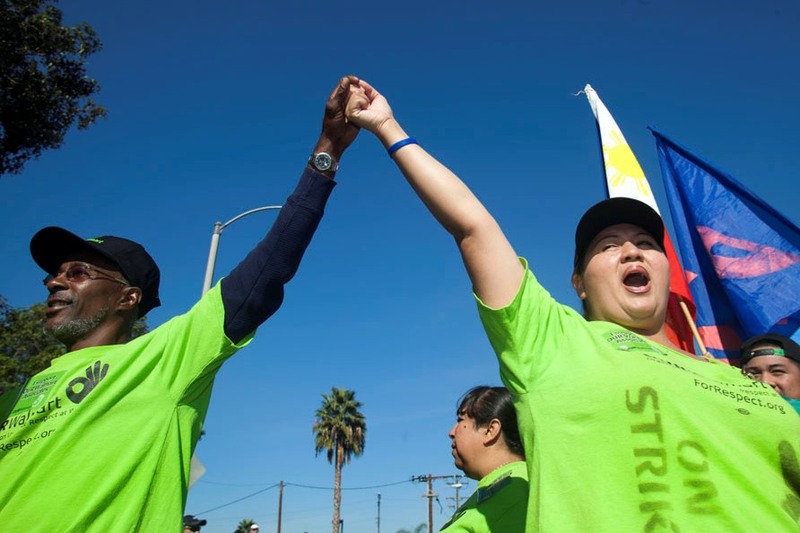 Collectively our workplaces offer millions of opportunities every day to challenge power: over the daily indignities of pay, hours, and disrespect, grievances, injustices that aren’t grievances, community issues like pollution of the neighborhood, lousy services for clients we serve. Struggle in the workplace teaches us that we have power—and how to use it. Working to convince fellow workers we have each other’s backs against a common enemy gives us practice in the organizing it takes to change the balance of power beyond the workplace, in society. Just as important is thorough education about who our enemies are, and aren’t, and how they’ve held onto power all these years when we outnumber them. That’s part of the back story to the 2011 toppling of Egyptian President Hosni Mubarak. Nearly 2 million workers joined a wave of 3,000 strikes over several years leading up to the revolution. “There’s no question that that pattern led to involving and breaking the fear of the rest of the people,” Kamal Abbas, director of the Union and Workers Services, told Labor Notes at the time. But unions don’t teach these lessons just by existing. Not a single twig of kindling for a worker wildfire is laid by finding “common interests” with the boss in a labor-management partnership; bringing new dues-payers into the union on paper but not engaging them in struggle; promoting two-tier contracts as “innovative”; or getting out the vote for weak-kneed candidates. Those activities not only don’t train or inspire. They grind people down. To resist the grind, we need to cultivate members who are long-distance runners. We all know someone who got fired up about some injustice, but dropped out when the first struggle they were involved in didn’t win. Think about the people in your union who have stuck with it. It’s usually because the union means something deeper to them than a single issue or a cold cost-benefit analysis. They feel the struggle in their bones, connected to their deepest-held values. They feel other workers’ fights as their own. More people will hold union struggles closer to their hearts when more unions think bigger… in the problems we tackle, the demands we propose, and the tactics we dare try. The righteous demand for $15 an hour inspires. Occupy too was exciting because of its boldness—not just another symbolic rally—and because “We are the 99%” rang true. Leaders often complain that members are “apathetic.” Exhibit A is poor attendance at union meetings. But who wants to focus on internal trivia, discuss which back-stabbing politician to endorse, or just get told what to do? Members will show up for things that matter—and that get their blood moving. Just look at the Brooklyn nurses who occupied their hospital to keep it open for care; the thousand North Carolinians arrested at Moral Monday protests last year; the migrant berry pickers in Washington who struck for nine days last July, though they have no union; the 250 UPS drivers who walked out in a wildcat to defend one wrongly fired union member. They showed up. So did the people of Chicago, who deluged teachers with support for their 2012 strike because the educators were brave enough to speak the ugly truth about “educational apartheid”—and because they led a battle to get rid of it. Other ugly truths: bus and train service keeps getting axed, while fares rise. Mail is getting slower, lines at the post office longer, Social Security office hours shorter. In the private sector most of us go to work every day and make the globe hotter and the boss richer. Union members need to level with the public: We don’t like this any more than you do. We’re on your side! Of course, some union leaders speak eloquently about social justice for all, while accepting two-tier for their own members without a fight. That’s hollow. A big-picture vision is no substitute for building power in the workplace—and members have to create and own the vision and the strategy for power. They have to be the agents and organizers, not the props. We like to think these movement-building principles are hallmarks of the troublemaking wing of the labor movement—and the numbers converging on Chicago April 4-6 for our biggest conference yet suggest the Troublemakers Union is growing (see labornotes.org/2014). But the “lie low” wing of labor still outnumbers us. If you accept the received wisdom, troublemaking seems risky in an era of union weakness. And the truth is, in the short term, sometimes you’ll lose either way. Look at Wisconsin, where despite the monumental uprising, Scott Walker pushed through his union-busting law. Look at the record school closures Rahm Emanuel forced on Chicago, even after the teachers’ heroic strike. Yes, often we fight and lose. But when we fight smart, we build a foundation for the next battle. It will take large-scale bravery to reverse the giant mess capitalism has made of everything—massive inequality, our unions sliding to near-extinction, our planet on the verge of eco-catastrophe. That’s why, in the long term, a movement with a troublemaking spirit—the kind that inspires people to bravery—is the only kind with a chance to win.